The Jewish banker Avram Kamondo who had bestowed many architectural works to Istanbul has quite a unique life story. The magnificent stairs across the former Otto-man Bank building in Galata and the Kamondo Business Center are only two of the works of art he had left to Istanbul… The mausoleum of this Istanbul lover in Haskoy is now left to delinquency. Among the works Avram Kamondo left to Istanbul are buildings such as his mausoleum in Haskoy, the famous “Kamondo Stairs” on the Bankalar Street in Galata. Kamondo Business Center, Saatgi (Watchmaker) Business Center, Yakut (Ruby) Business Center, Kuyumcular (Jewelers) Business Center, Luleci (Meerschaum Sculptor) Business Center and Gul (Rose) Business Center, and fountains. 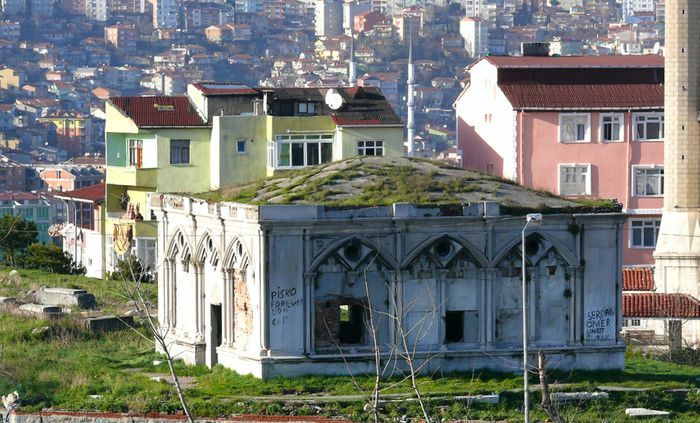 Avram Kamondo’s mausoleum was first within the boundaries of the Haskoy Jewish Cemetery;however, it is now on the right of the road which was opened to connect Okmeydani to the Golden Horn Bridge. The building is on a small hill. Unfortunately, the mausoleum cannot be protected enough although it was included in the list of the cultural heritages by the Board of Protection of Cultural and Natural Objects. No one can prevent stealing and destroying of the marbles, irons and leads on the mausoleum which is now a shelter for drunkards. The building cannot display its old neogothic style glory. Avram Kamondo had the unique Kamondo Stairs built in the street across the former Ottoman Bank building in Galata district to enable his son to visit him comfortably. and the other famous building of the famous banker was the Kamondo Business Center. On the ground floor of the building that was built as four-storey in neoclassic style as Number 36 on the Serdar-i Ekrem Street in Galata towards the end of the 19th Century there were stores and shops. The wooden bay windows on the second and third floors added a distinctive characteristic to the building. Many authors, poets, sculptors and painters lived in Kamondo Building. Among them were Arif Dino, Ahmet Hamdi Tanpinar. Sait Faik, Yasar Kemal and Orhan Veil. Avram Kamondo was born in Istanbul, Ortakoy in 1758 into a Spanish-Portuguese origin Jewish family. The family had migrated to Istanbul in the 18th Century. His father was a town crier and at the same time he was among the administrators of the Ortakoy Synagogue. The bank which was founded by Avram Kamondo and his brother Izak became one of the leading banks of the time. The entire wealth was left to Avram Kamondo when his brother died of plague in 1832. Galata bankers were dealing with all kinds of financial and monetary transactions as of the second half of the 19th Century and they had great influence on the economy, finance and politics of the Ottoman Empire. Avram (Abraham) Kamondo was one of the most important ones among these Galata moneymen. Ottoman Empire’s entrance into the guidance of the West, collapse of the production and industry in Anatolia and connecting the economy to the trade with Europe caused emerging of such powerful bankers like Avram Kamondo. The delicate vital spot for these bankers was selling the goods that were purchased with loan from the West in return to cash and loan this great amount of money they have in hand with very high interests and make huge profits. This article is published for enmarbg. For more interesting information about Bulgaria trips, please visit Bulgaria trips.